The Golden Retriever breed was originally developed in Scotland at Guisachan near Glen Affric, the highland estate of Sir Dudley Marjoribanks. The original cross was of a yellow-colored Retriever, Nous, with a Tweed Water Spaniel female dog, Belle. Majoribanks had purchased Nous in 1865 from an unregistered litter of otherwise black wavy-coated retriever pups. In 1868, this cross produced a litter that included four golden coloured pups; these four became the basis of a breeding program which included the Irish Setter, the sandy-colored Bloodhound, the St. John’s Water Dog of Newfoundland, and two more wavy-coated black Retrievers. The bloodline was also inbred and selected for trueness to Majoribanks’ idea of the ultimate hunting dog. His vision included a more vigorous and powerful dog than previous retrievers, one that would still be gentle and trainable. The temperament of the Golden Retriever is a hallmark of the breed and is described in the standard as “kindly, friendly and confident”. They are not “one man dogs” and are generally equally amiable with both strangers and those familiar to them. Their trusting, gentle disposition therefore makes them a poor guard dog. As the name suggests, the Golden Retriever loves to retrieve. Whether the object is a thrown stick, tennis ball, or flying disc, retrieving can keep a dog of this breed occupied and entertained for hours, particularly if water is also involved. Goldens might also pick up and “retrieve” any object that is near to them upon their masters’ arrival, all of this lending to their retriever name. Goldens are also noted for their intelligence, and can learn up to roughly 240 commands, words and phrases. These dogs are also renowned for their patience with children and are good with other dogs, cats and most livestock. Golden Retrievers are particularly valued for their high level of sociability towards people, calmness, and willingness to learn. Because of this, they are commonly used as guide dogs, mobility assistance dogs, and search and rescue dogs. They are friendly and tend to learn tricks easily. Golden Retrievers are moderately active dogs, and require a reasonable amount of exercise each day, although exercise needs may vary depending on the individual dog and its age. They are a breed that is prone to obesity, even more so than the Labrador Retrievers. 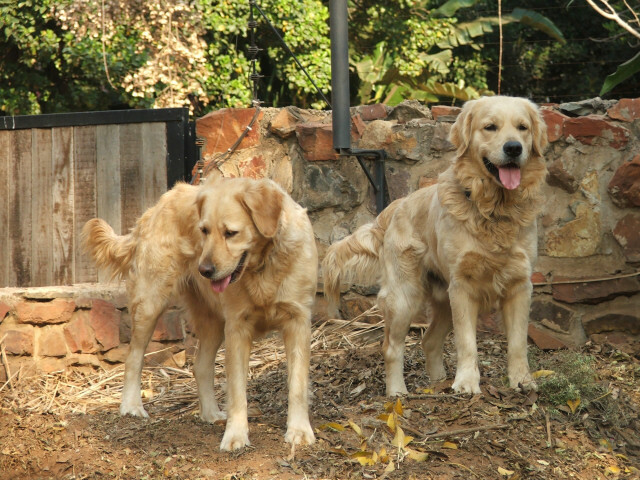 Goldens should be groomed at least once a week, and every day during heavy shedding. Their coats shed heavily the entire year, and even more excessively during shedding season, which is normally in the spring as the dog loses its thick winter coat. I’am thinking of getting a golden Retriever as a puppy for my daughter. Is this a right choice? Is a Golden Retriever good with small children? My daughter is 6 years old.